1 April - 3 September. 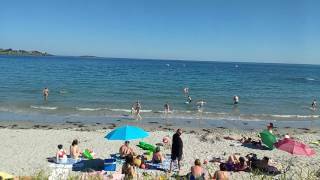 Just a few steps from the fine sandy beach of Kersidan, facing the Glénan archipelago, and a short drive from the historic town of Concarneau, Camping le Suroît is a small family site ideally located for a relaxing seaside holiday. 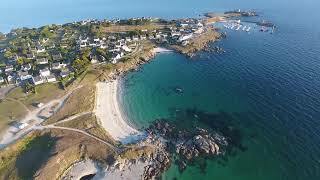 However, there is a wealth of places to visit in this picturesque part of southern Brittany should you fancy a change from the beach. There are just 70 pitches, of which 40 are for tourers, with 6/10A electricity; the other 30 are occupied by mobile homes for hire. Although there is no bar or restaurant on site, there is an excellent one by the entrance, and the nearby town of Trégunc has shops, bars, restaurants and a supermarket. Concarneau, with its walled town and its huge choice of bars and restaurants, is well worth at least one visit. Pont Aven to the east is an attractive riverside town famous as a Mecca for artists, with numerous galleries as well as shops and restaurants. 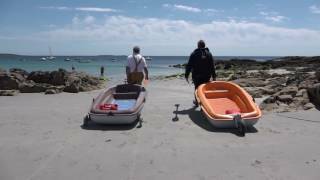 Boat trips to the Glénan islands leave from Concarneau or you can take a river cruise on the Aven, or on the Odet at Quimper. One clean, modern toilet block has controllable showers some washbasins in cabins. En-suite unit for disabled campers. Washing machine and dryer. Small shop for essentials. TV/games room. Small playground. Boules. Bicycle hire. WiFi over site (free). Travelling southeast from Quimper on N165 (Nantes-Brest), take exit 49 for Rosporden and Tregunc. Follow signs for Tregunc on D122. Then south on D1 for Point de Trevignon, continue on D1 to campsite. Site is on left after 1 km. well signed. 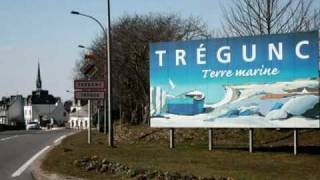 TREGUNC - "Entre terre et mer"